The number of kids who struggle with thoughts of suicide or who attempt to kill themselves is rising. New research, published Wednesday in Pediatrics, finds children ages 5 to 17 visited children’s hospitals for suicidal thoughts or attempts about twice as often in 2015 as in 2008. As someone who spent much of his early counseling career working with children and teenagers, this news is heartbreaking to me. The reason I decided to go into counseling is because I knew what it was like, all too well, to be a young person who struggled in silence with the overwhelming pain and confusion of mental illness. I never wanted a young person to feel as alone as I did and wanted to make a difference in their lives like my teachers and counselors did for me. I think this part is very important because, oftentimes, so many people are led to believe (incorrectly, I might add) that they are so different, broken, and odd and strange that they are not worthy of the same love and affection that “normal” people are. 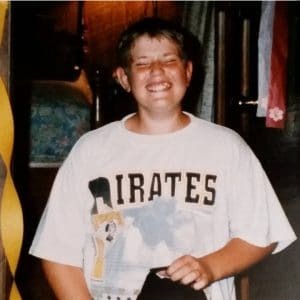 I would make sure that my younger-self knew deep down, past the fake smiles and self-deprecating jokes, past the fake self-confidence, and past his inner turmoil fueled by his inner critic that he is worthy of love, acceptance, and happiness in life. No matter what anyone says! When I was first diagnosed with bipolar disorder, I did just that. I let it become who I was instead of a source of information to best help me manage my life. I identified solely with this illness to the point that I believe it made me more symptomatic. I would read about the symptoms and presentations of bipolar disorder and would begin to exhibit those symptoms in my life. Ask any university student who’s taken an Abnormal Psychology class, I’m sure they’ve diagnosed themselves and their friends and family more than a few times. I started to see myself in the textbook instead of just seeing myself. After a few years of living with and managing my illness, I learned that I am still me despite my diagnosis and am a valuable and unique human being. I’m not just a collection of symptoms in a textbook. I would remind my younger self to not get so wrapped up in his diagnosis and tell him that it’s not the end of the world but also encourage him to learn from it and others who have it. This is one reason I believe social media is so huge right now because I’ve been able to connect with so many people from around the world who live with a mental illness and are doing amazing things! I think this one is hard to swallow, so to speak, because even as an adult, I want those who are around me to understand, empathize, and offer support when I need it but it’s not always reality. I’ve had many people who’ve been there for me and have let me be there for them but as many people as I’ve had by my side during the bad times, I’ve probably had just as many unfriend, unfollow, block, avoid, or walk away from me. I used to take this so personally until I realized that some people are just not going to understand and that’s OK. Instead of worrying about those who’ve walked away (we’ve all had them) invest your energy, time, and love in those who’ve walked into your life, stayed by your side, and surround yourself with people who bring out the best in you. I’ve found this to be far more rewarding (and less stressful) than trying to get everyone to understand the complexity of a mental illness. It’s a bit cliche, but those who want to be in your life will and those who don’t want to be in your life won’t. At first, it hurts until one day you find yourself surrounded by people who do want to be in your life and you wonder why you missed the others to start with. Surround yourself with people who love the real you because it truly does make a huge difference. I would emphasize to my younger self that medication, doctors, and therapists are not the enemy and are only able to help you as much as you want to help yourself. I grew up with a mom who often avoided facing the truth in therapy, boasted about deceiving doctors, and took her medication as she saw fit. I would encourage my younger self to be his own advocate and to spend lots of time getting to know himself and his body because no medication, doctor, therapist or treatment is one-size-fits-all and remind him that it may take a while to find the best fit and that’s OK. Be patient and believe in the process. Of course, there will be times you feel alone, but you’re not. There are people all around the world and because of the internet, you can meet, support, and love each other from anywhere on the planet. There are people who will encourage you and you will encourage them by sharing your stories of victory and sorrow; you will walk this journey together and will never be alone. At times, your illness will whisper to you “pull away and forget all of them” but this is the worst thing you can do! It’s in these times that you need people the most. You need them and they need you. Be willing to ask for and give help when it’s needed. In closing, I would tell my younger self that taking his life is never the answer. No stress, heartache, pain, grief, girl or hurt is worth ending the gift to this world that his life and even though it may feel like the only option, there is always a plan B if he’s willing to seek it out and ask for help. These are a few things I would tell my younger self about mental illness in hopes of encouraging him to be his best self.